B and I decided to do “date night” on Saturday instead of going out with the crowd like we normally do. Sounds like something that only happens on Real Housewives, but there’s something to be said for spending quality time together every once in a while. I deemed it an appropriate time to finally break out these magnificent Miu Miu carved wooden heels that I found online a while ago. I’m sad to say I didn’t wear them sooner. Love them. Want to wear them always. the shoes are fabulous! And i love your top. FABULOUS shoes. I especially love the detail. those shoes, are great. I love all your jewelry too! J and I had a datenight last weekend too and it was fantastic. and i've said it before, but ill say it again, i love that necklace! WONDERFUL details, and WONDERFUL shoes! Also hope you had a WONDERFUL time (to continue my little theme) on your date night. Those shoes are amazing. You're very good at creating "wants". Damn you. I would want to wear them always too. WOW. And woop woop for date night! Oh, honestly, those shoes!! So fabulous… speaking of fabulous, my mother has an opal ring similar to yours, opal is so beautiful! Here, you look so chic, put-together and expensive. Glorious! yeah… those are amazing shoes!! great blouse too. those heels rock, wear them forever! it's nice to see the details of that shoe!!! 😀 stunning! I'm with U. Those heels are incredible! The shoes are great but I fell in love with the top. So simple yet such intricate details. Great find. + your top is gorgeous also ! Magnificent indeed! Those are works of art. I love this whole outfit. So cute! Absolutely stunning shoes, darling! Works of art! Oh man. Those shoes kill me, they are so awesome. Also loving the texture on the blouse. Goregous! wow nice SHOES! thanks for the comment 🙂 was wondering if you wnana swap links! Love love the shoes, and that if your title is a reference to Patti Smith, well then, extra love all around! i literally just drooled when i saw those shoes. they are great. hope you had a fun night. Those shoes are amazing! I love the detail in them! They are keepers for sure. Those shoes are absolutely stunning! You have such an amazing collection. I'm having major shoe envy! I can't even handle the shoes they are so amazing. Like…I died. um I hereby classify every occasion appropriate for those heels. They are….amazing…. LOVE those shoes- especially with the rolled up jeans! date night sounds like fun, E! :) oh gosh, love love u miu mius! the carving is beautiful! THOSE. SHOES.! need i say more? And I love date nights. oh they're like art! kiiiiinda remind me of clogs with the wood and studs but more summery. adore. Pretty cool shoes! I like the simplicity of your outfit. Stunning, I would kill for your wardrobe girl, haha! The shoes are so wonderfully woodsy. A very stylish nymph would probably wear them. Great outfit! Love the blazer with that shirt. Those shoes are killer. You look gorgeous, E! I love those heels! OMG – loving the mui muis! How great will those also look this summer with a worn out pair of levis or cut offs – super rad! G-L-O-R-I-O-U-S shoes. surriously. love the carved wood. I love the carvings on your shoes, so cutte! AND, I absolutely love this outfit ~ I think it is the most chic I have seen on you yet ~ that first picture of your shoes? to.die.for. wow! I like the shoes! your shoes are SHOCKINGLY AMAZING!!!! those shoes are to die for E! as always you look stunning! that carved out wood details are amazing ! thanks much for the comments dear ! visit – follow – comment me back at..
woah those heels are intense, loves it! love the details of your Miu Mius! The miu miu are so gorgeous, I would wear them all the time too. And that top is beautifull! The shoes are great – you get tons of height, but they don't look uncomfortable. Your locket is gorgeous, too. i NEED your shoes! lol..they look amazing! I love your shirt. The textures in this outfit are so good. Lovely style. The shoes are really nice. Woah I love the carving going on on those shoes!! 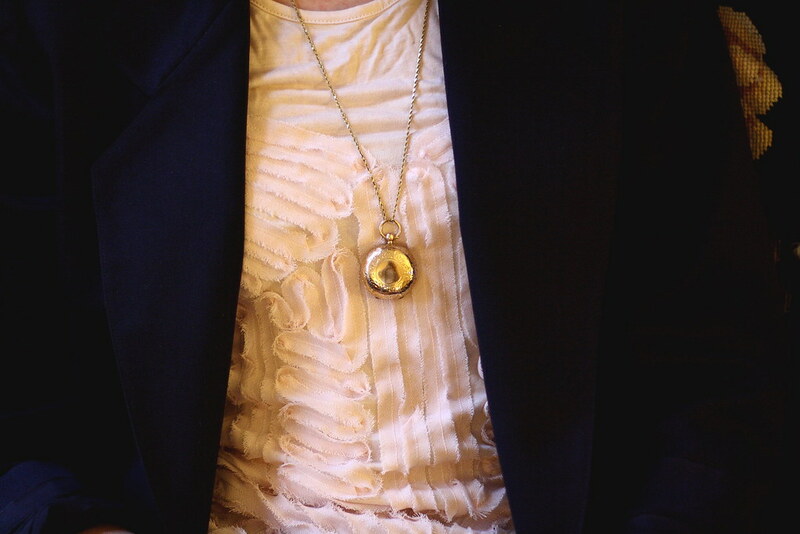 And the locket is so pretty against the textured shirt! Love those shoes they are simply amazing!! those are amazing shoes! don't you love online shopping? Can I just say WOW! I am sooooo loving this outfit. It's most definitely my favorite outfit I've seen yet this week. Everything about it is so chic, but the jacket keeps it professional. Loveth those shoes, too. this is incredible! !so chic and stylish in deed!! 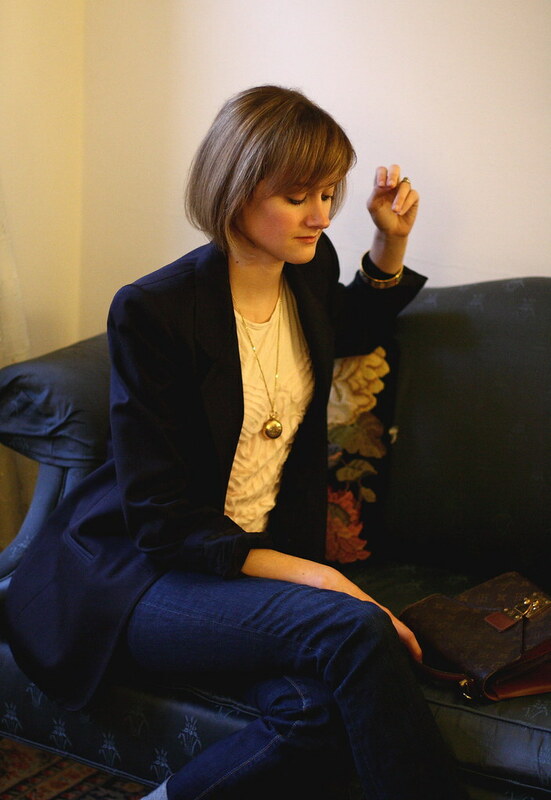 !i've only recently started blogging the shoes are hot but the LV bag…..amazing…i loved your entire blog definitely following u!! !